ObjectiveTo assess the effectiveness of penicillin for three days and treatment for seven days compared with placebo in resolving symptoms in children with sore throat. DesignRandomised, double blind, placebo controlled trial. Participants156 children aged 4-15 who had a sore throat for less than seven days and at least two of the four Centor criteria (history of fever, absence of cough, swollen tender anterior cervical lymph nodes, and tonsillar exudate). InterventionsPatients were randomly assigned to penicillin for seven days, penicillin for three days followed by placebo for four days, or placebo for seven days. Main outcome measures Duration of symptoms, mean consumption of analgesics, number of days of absence from school, occurrence of streptococcal sequelae, eradication of the initial pathogen, and recurrences of sore throat after six months. Conclusion Penicillin treatment had no beneficial effect in children with sore throat on the average duration of symptoms. Penicillin may, however, reduce streptococcal sequelae. Simultaneously with our trial in adults we performed a double blind, randomised trial in children aged 4-15 presenting with sore throat, comparing the effectiveness of penicillin V for seven days, penicillin V for three days (followed by placebo for four days), and placebo for seven days. We described the methods in detail in our earlier report.2 Overall 308 children aged 4-15 contacted their general practitioner because of an acute sore throat. We excluded 45 children because of medical reasons, such as an imminent quinsy (n = 28), (suspected) scarlet fever (n = 9), an intercurrent disease requiring antibiotics (n = 6), and intolerance to penicillin (n = 2).4 The participating general practitioners were experienced users of these so called Centor criteria, which were developed to trace patients with streptococcal tonsillitis.5 Of the 262 eligible children 156 were randomly assigned to one of three treatment groups: penicillin V for seven days (n = 46), penicillin V for three days followed by placebo for four days (n = 54), or placebo for seven days (n = 56). The dosage was one 250 mg capsule three times daily for children aged 4-10 and two 250 mg capsules three times daily for children aged 10 and older. The patients were randomly assigned according to a computer generated list that was blinded to both patients and doctors. The figure shows the flow of patients through the trial. An independent pharmacist filled and numbered the medication trays. Each general practitioner received medication trays from the study coordinator, to be used in the numbered order. After six months of follow up the parents of the children were informed by telephone about the treatment received. Throat swabs were taken after randomisation and again after two weeks, and a diary was given to the parents. During the study they recorded the children's attendance at school and possible side effects of penicillin. The primary outcome variable was the duration of symptoms, defined as the number of days of symptoms after randomisation until the pain had resolved permanently. Secondary outcome variables included mean consumption of analgesics (in days), absence from school, development of streptococcal sequelae such as an (imminent) quinsy, eradication of the initial pathogen after two weeks, and recurrent episodes of sore throat during the six month follow up period. Imminent quinsy was defined as a unilateral, peritonsillar or tonsillar swelling with oedema and exudate, pushing aside the uvula. Informed consent was obtained from the child's parent or carer. With at least 52 children in each of the three groups a difference of one day of duration of symptoms could be detected at a 5% level of significance with 90% power. For subgroup analysis a total of 20 children per group would be needed to detect a difference of 1.5 days of duration of symptoms. We performed all analyses on an intention to treat basis. The mean age of the included children was 10, half (78) were boys, and the mean duration of complaints before inclusion in the study was three days. We observed no relevant baseline differences between the three treatment groups (table 1). In children with group A streptococci (n = 96) who were treated with penicillin for seven days the sore throat resolved permanently 0.5 (-0.6 to 1.5) days sooner than in children who took placebo, whereas in those who took penicillin for three days the sore throat resolved permanently 1.3 (0.2 to 2.4) days later than in the placebo group (table 5). We found no differences in mean consumption of analgesics (table 6). Penicillin treatment for seven days was more effective than treatment for three days and placebo in eradicating group A streptococci. The eradication rates were 68%, 35%, and 28% in children who took penicillin for seven days, three days, or placebo, respectively (P = 0.003). Eleven children developed a streptococcal sequela: nine had an imminent quinsy, one scarlet fever, and one impetigo. 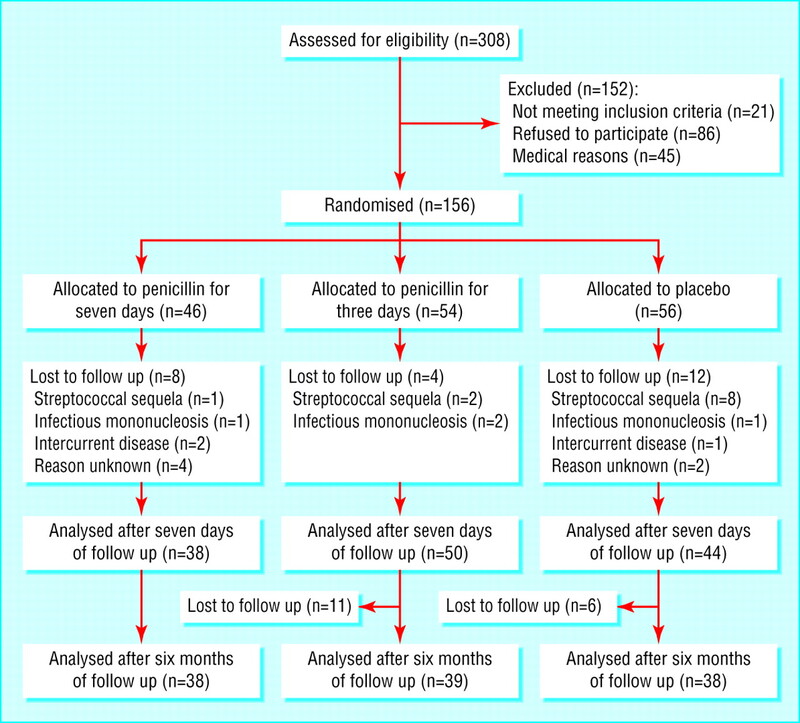 In the group taking penicillin for seven days one child (0.02%) experienced a streptococcal sequela, compared with two (0.04%) in the group taking penicillin for three days, and eight (0.1%) in the placebo group. The incidence rate ratio of seven days of penicillin versus placebo was 0.15 (95% confidence interval 0.02 to 1.2); the incidence rate ratio of three days of penicillin versus placebo was 0.26 (0.06 to 1.2). After breaking the treatment code all 11 children received new, prolonged, or alternative antibiotic treatment. They recovered uneventfully, without referral to a hospital. The occurrence of possible side effects, such as abdominal pain (38%), diarrhoea (26%), and vomiting (30%) did not differ between the three treatment groups. The preparatory training of the general practitioners to take throat swabs for culture, the use of two swabs instead of one per patient, and updated laboratory techniques11 are likely to have contributed to the high yield of streptococci in this study. In this way group A streptococci, possibly those in cultures with a low colony count, were detected that would have been missed by the techniques applied in previous studies. Cultures with a low colony count have been assumed to be more prevalent among carriers of group A streptococci who do not have an infection than among those having true streptococcal disease.7 9 12 Therefore we believe that the prevalence of streptococcal infections in our study is unlikely to differ from clinical practice or earlier studies. We probably included many carriers of group A streptococci in our group A positive children, which may have diluted the effect of penicillin. The finding that the three day penicillin group had a slower recovery than the placebo group is in accordance with our finding in adult patients.2 The increased recurrence rate of sore throat at the end of the first week is probably due to the three days' exposure to penicillin, reducing the natural immune response without eradicating the pathogenic streptococci. As we expected, not all children with acute sore throat were included by the participating doctors. The inclusion rate, however, is in line with other randomised trials on the effects of antibiotics in upper respiratory tract infections in primary care. Possible reasons for a lower inclusion rate are that, firstly, doctors did not include all eligible patients, notably during busy office hours and during holiday periods, and secondly, patients may have visited other doctors who were not participating in the study—for example, because their own general practitioner was on leave or because they did not present during office hours. Since this selection is expected to be independent of patients' characteristics, it will not influence the generalisability. The results of our study showed that streptococcal sequelae seem to occur more often in the placebo group than in the penicillin groups, but the power of our study, like all other individual trials, was too limited to draw firm conclusions. On the other hand, the observed trend is in concordance with a Cochrane review of trials in adults and children with sore throat.3 In this review the incidence of suppurative sequelae, such as acute otitis media and sinusitis in patients treated with antibiotics, was 50-75% lower than in the placebo group. Furthermore, these sequelae can safely be treated at the moment of occurrence, and their prevention is not a specific indication for antibiotic treatment in sore throat. In view of the extremely low incidence of potentially severe post-streptococcal sequelae such as rheumatic fever in affluent Western communities, rising antibiotic resistance rates, and the high carrier rate of group A streptococci in children, we advocate prudent prescription behaviour with respect to penicillin. General practitioners are recommended to treat children having an acute sore throat only when they are severely ill (unable to drink, an imminent quinsy) or at high risk (history of rheumatic fever, having an anatomical or immunological disorder, high incidence of streptococcal infections in the community). Contributors SZ initiated the research, designed the protocol, and collected the data. MMR analysed the data. RAdM was involved in the study design and the interpretation of data. AWH was involved in the study design and data analyses. All authors participated in writing the report. SZ will act as guarantor for the paper. Funding This study was funded by Groene Land Achmea Health Insurances and the Stichting Gezondheidszorgonderzoek Ysselmond in Zwolle. Ethical approval The study protocol was approved by the medical ethics committee of the Isala Clinics, Zwolle.
. Practice guidelines for the diagnosis and management of group A streptococcal pharyngitis. Clin Infect Dis 2002; 35: 113–25.
. Penicillin for acute sore throat: randomised double blind trial of seven days versus three days treatment or placebo in adults. BMJ 2000; 320: 150–4.
. The diagnosis of strep throat in adults in the emergency room. Med Decis Making 1981; 1: 239–46.
. NHG Standard “Acute sore throat.” Utrecht: Dutch College of General Practitioners, 2002. http://nhg.artsennet.nl/guidelines2/E11.htm (accessed 21 Nov 2003).
. Guideline 34: management of sore throat and indications for tonsillectomy. Edinburgh: Royal College of Physicians, 2001. http://www.sign.ac.uk/guidelines/fulltext/34/summary.html (accessed 17 Nov 2003).
. Beta-haemolytic streptococci isolated from acute sore-throat patients: cause or coincidence? A case-control study in general practice. Scand J Infect Dis 2000; 32: 377–84.
. Asymptomatic pharyngeal carriage of beta-hemolytic streptococci and streptococcal pharyngitis among patients at an urban hospital in Croatia. Eur J Epidemiol 1993; 9: 405–10.
. The prevalence of beta-hemolytic streptococci in throat specimens from healthy children and adults. Implications for the clinical value of throat cultures. Scand J Prim Health Care 1997; 15: 149–55.
. Potentially virulent strains and high colony counts of group A beta-haemolytic streptococci in pharyngitis patients having a delayed recovery or a complication. J Antimicrob Chemother 2001: 47: 689–91.
. Streptococcus. Murray PR, Baron EJ, Pfaller MA, Tenover FC, Yolken RH eds. Manual of clinical microbiology. 7th ed. Washington: ASM Press, 1999: 283–96.
. Significance of quantitative salivary cultures for group A and non-group A beta-hemolytic streptococci in patients with pharyngitis and in their family contacts. Pediatrics 1979; 64: 904–12.
. Internalization-associated proteins among Streptococcus pyogenes isolated from asymptomatic carriers and children with pharyngitis. Clin Infect Dis 2003; 37: 173–9.